After long months of drafting, meeting, fixing, tweaking, the mural finally made its appearance. On a windy Saturday, October 1st, a small portion of the community came together to set up the big day. Groups of people carrying and lifting boxes up and down. Trash and garbage were being removed. Balloons are getting blown up, pinned up, and then popped in the wind. Tents were coming together and so was the event setting. As time reached closer to the start of 10, the wind continues to blow, guiding people into the event. Time hits 10AM, and volunteer got to their stations. Audience start to gather by the mural's veiling, hoping that the wind blew hard enough for people to take a glimpse. Luckily, the veil was tight enough it didn't catch wind to fly away. People started to mingle, scouting for food. Little people and big adults gather to get cotton candy, snacks, and drinks. People brought the sunlight under this cloudy chill day. Local news reporter, and interviewers pick their corner. This mural was the talk of the town. Members of the project gets pulled in from every corner. Interviewer asking about the process of its making, the meaning behind it, the reference made in the mural. Some hard question, some easy questions. Long answers, short answers. All interviews pulled hours closer, by then, time hit 11AM. The mural is finally unveiled people to see! The sun fell out, some people clapped and cheered, others were in awe. Audience gathered closer for a picture of the mural, of themselves with the mural. Drones were flying across the sky, scanning every panel. Next thing you hear are people congratulating members of the mural. Some people were thanking as well. Reporters ask the team to get together to get a photo of recognition in front of their piece. Long after catching up, seeing the unveiling, the mural and all, people start to pick up and leave. The community knew that the mural isn't going anywhere, and that people can come back to see it anytime. Volunteers clean up, audience leaves, and the team head out to eat for celebration. Everyone leaves the mural's site because they knew that it's here permanently, and here to stay. Just because the community in action mural is done, doesn't have to mean it's its last, but there is no promise to keep. We hope to grant the community an understanding that they may do project that is just as similar and different. As of now, the community will take one step at a time, and a reminder that it is here to stay! Till so, the team would like to thank everyone who got involve to help make this mural happen. Middle row; left to right: Tommy, Joan, Tran, Kim, Susan, Justin. Bottom row; left to right: Grace, Kimberly, Michelle. Want to see it in person, but have no idea where it's placed? No worries! Come check it out at 1370 Dorchester Ave., Dorchester, MA. Thanks to the Dorchester Reporter for covering our project continuously since the beginning! "What’s exciting about this public art project is that it’s a team effort in every sense of the word. Tam Le, whose family runs Pho Hoa and the companion Reign Drink Lab, has been an eager partner." Within this month, the mural project was submitted into the Boston Ujima Project's grant. Project after projects, rolling in and out, Ujima had approve it into the next round. However, that did not confirm its chances of being granted with the reward just yet. The next round revolved around pitching the project to the Ujima team, publicly, to be granted the reward. Only that pitching was not the problem, it was time that did not work so well with our local lead artist. Tran was actually out of state, caught in the hurricane trying to get out while the pitch was happening. When Tran finally made it into Boston, she was informed that her project was granted by Ujima's gift. How was that even possible?! Truth to be told, Tran actually asked her assistant in favor to pitch while she attempts to leave Florida from Hurricane Irma. I'm grateful to say, it was a great experience to pitch and have a follow up on receiving the grant from Ujima. On the day of pitching for the grant, the weather started off fairly cool and bright. Ujima's themed event, "Dreaming Wild," was located at the First Church of Roxbury. I raced my way there only to figure out, I was already late, but the programming was also delayed. Gathering my thoughts, I muttered my lines well enough to pitch it. I have to admit, I was nervous. I also have to admit that I was confused and hungry, for I was one of the youngest people to pitch at an environment I did not recognize. Not long, I met other people along the way who also had to pitch their great ideas, and plans. Ideas from businesses and other artists that had projects benefitting communities in the most incredible ways. Again, I went to mutter under my breath to make sure that I fit the time frame. Flashing forward in time, the pitching stage was moved to another room. Artists were pitching first, and in the line-up there were ten presentations to get to. Of all ten presenters, this very project was first to pitch. The time frame given was two minutes. I wished there were more time to pitch the idea, but two was all I had. To start a two-minute pitch... I threw a disclaimer that the lead artist is flying away from the hurricane, and that I am only seventeen years old, and pitching in a room full of adults. The faces changed so fast when I stated such facts. Running through what I had rehearsed, I still couldn't manage the time; Two-minute was gone. Never have I thought I would ever be scared of two-minutes in my entire life. I watched the two-minute cut into peoples presentation, and create a strong nervous pressure. Presenters sat back down after the pitch, all there was left was waiting. The pressure and long wait ate art presenters alive. We were dying to know who was given the grant, wishing each other the last of lucks. Time was still ticking, slowly. The waiting time span literally had me questioning, "Why was this time-span not the presenting-time, instead of just two minutes?" Voting numbers wrapped up, and it was time to announce. That was when Tran had landed, and Ujima had granted us our reward. We were given the grant. We were given Ujima's gift. Overall, I thought it was a new experience. Ujima did a very well done job on the programming, setting up, and orientations. We would like Ujima, and Ujima members for granting us the reward, and giving us an opportunity such as this! I hope that Ujima gets far in its existence and its time-span! Otherwise, if you would like to know more about Ujima, you can follow-up on their link right below! We are just grateful for Ujima's dear gift from their sponsors and program! We are beyond excited to unveil this mural soon! Please check back for more updates. In the meantime, do remember to use the hashtags #VietStoriesMural and #DOTCommunity as we are creating a communal digital archive. Rain check: New date is now Sunday October 1st 10am-1pm, see you there. Please join us for the unveiling celebration of the Community in Action Mural Project! There will be food, music and lots of festivities for all ages. Xin vui lòng tham gia cùng chúng tôi để kỷ niệm lễ công bố của "Dự Án Nghệ Thuật trong Cộng Đồng"! Sẽ có thức ăn, âm nhạc và rất nhiều lễ hội cho mọi lứa tuổi. Sunlight seeps through windows to announce the perfect weather on this past Saturday for the third meeting with Steering Committee team. Though it may have felt like this was going to be last meeting session for the Steering Committee, it is most definitely not the final time that we will meet. As members gather, in the midst of still waking up, people were still excited to see what is on the table to be discuss, and especially what will cover the blank canvas. Constructive comments entered the atmosphere, and feedbacks were given. Picking one image to next ones, the art team and lead artist did their best to dissect parts of the image explaining origins of how it made to the big picture. Later that day, everyone was taken to the location of where the big canvas lies to see how things are progressing. Tran unrolls the scroll that holds the picture of untold (to the public)! Left to Right: Tam, Duoc, Tony, Tran, Michelle, Hung, Joan, Tommy, Kathy. Posing with happiness after seeing the work the progress. All in all, things went amazing and feedbacks given from each members are very helpful! We are all very excited to see what will show at the unveiling! It has been a while since anything was updated. It would be nice to apologize, but it seems better to announce that while away, the art team has been getting to work with a few extra helping hands. For the past few weeks, members would come in at their own time to grid, and put down marks onto the blank canvas. The team did great amounts of bonding time and had well-given advice to each other during the marking process. Every moments were positive and productive. Everyone would cautiously move around as they drew, and took a step back at every moment given to check their process. Art team discussing about where each picture is placed with measurements. Tony casts his own shadow to see his mark more easily, while Hung cautiously measures and make proportions to his images. Though not all art team members could not be there to help physically, they helped behind the scenes of this behind the scene. All help was great from everyone, including people out of the art team. With this much help and support from all sides, this mural will turn out incredible and so far based on the marks, it looks good! However, marks are not final, and good may always be better and that is what we will achieve! We are raising additional funds through the KIND Campaign and we would love your help by voting for our community-led mural project! You can vote up to four times directly here. Please do help spread the word to your family and friends as well! Thank you for your support. From long days of work, from different areas, the art team still had few more task to go for. After the Steering Committee meeting from Saturday, art team got together to further discuss on the suggestions made of the draft presented on Wednesday. The team was deciding the proportions of the boards and how the small art work was going to be stretched into the big canvas itself. They knew they had to get smart with art on a physical level. Getting back on the drawing boards, then members came along to work with the real boards for the following days. Down in an eerie location, where pieces of the mural canvas is at, members changes up the mood of the location. Everyone was hard at work, having fun and bonding with members of different age range! Kicking shoes off to work in comfort! Every members had their hands on deck! From heavy lifting, sanding down boards, rolling on base coats, mixing paint, etc. There was a lot to be done, in a cut-out time! However, in all hard work, there were still moments to have fun! Music, laughter, and jokes flew in and about the location! How said working had to be boring and serious all the time? Hung is unwrapping a new board with Tony (off camera) to prep for the sanding process. As far as this process goes, it seems like there will be no problem working with one another. It already seems like a big family at work! This project as only pulled community members closer by every meet! The week was long, this Saturday started slow, but that did not stop anyone from getting work done! Though a few members could not make it, each members still participated like last meet. In the time span between last Steering Committee meeting to this recent one, art team has been putting drafts of what the blank canvas would showcase. Drafts followed by drafts, there was something to present in the meeting. However, just because it was presented to the meeting, does not mean the draft is made final. Throughout the meeting, every member contribute ideas and feedbacks to further challenge the creativity in the project. Questions were thrown from every sides of the room asking if the theme and art piece itself meant each other halfway. Most times, the meeting was serious, but of course there were fun discussions as well. Hopefully, by the next meeting session, ideas placed on the table would come alive in the final product. After a long day of meeting session, it seems that members are glad we are steering forward! On a cool Monday, Vietnamese American poet Bao Phi had held an event at the Pao Art Center, where he passionately reads his pieces, from his published book, "Thousand Star Hotel," then ends it on a question and answer session. His published book contains poems written from his experiences, his parents' experience, struggles from being Asian and/or foreign. Written pieces dissects the idea of self-hate, love desire, etc. The process of the book was written in a mindset, which he challenges himself to resist the negative lens given by culture and society. This event was very special and worth the experience. Especially hearing from Bao Phi, as he shows his colors and great gratitude to every members (from volunteers, staffs to audience members). He also spoke about the importance of having more than just one Vietnamese narrative and that the Vietnamese people are the best ones to tell their stories. Don't worry if you missed his reading, you can still get a hold of his book, "Thousand Star Hotel," where you can read more pieces than what he presented that day! All in all, it was a great way to end a Monday night! Artist's at work! In the moment, artist team were discussing how designs could improve! Art Team decided to go outside to talk more on how the mural could be assembled on the wall! On Wednesday, the artist team got together to discuss more about design that is being placed upon the wall. It was suggested that we go outside and look at the wall to get better gist of what was happening. Not long after, ideas being suggested were put together! Though Justin could not make to the meeting that day, physically, he called in to join the discussion. Happy to say, after long time drafting with the design idea put together, we can bring this idea to the Steering Committee soon! No need to wait any longer! The boards are finally in! Tam and Hung are taking care of the board upon its arrival! With the boards in, the mural project is getting closer to the painting process and its opening as well! We are all excited with the whole process getting a move on the road! "Tied Together by a Thousand Threads"
Missed out on the unveiling of another community's mural, in Chinatown, on this cloudy morning? Don't worry! Think Chinatown 2017 Team, ACDC, and their supporting members have put up a mural that goes through the history of Chinatown itself. The ceremony provided acts, bubbles, and the inspirational backstory of how this mural came to be as well. Though it may seem conveniently best to tell it here, it would defeat the point of see this mural yourself. The mural is located at 15-25 Harrison Avenue, next to Beard Papa and Chatime. Go check it out and support the project! On this sunny Saturday at 3pm, the Steering Committee board came together to discuss about the mural. The agenda consisted of many tasks to go through, but that did not slow the team down. The first thing each member did was introduced each other to the whole team after doing "turn-and-talks." But, of course, turning and talking, and introducing each other does not tell each board members much about how everyone works. Certainly, to see how members work with each other, we loosened the tensions and went into a team building exercise. 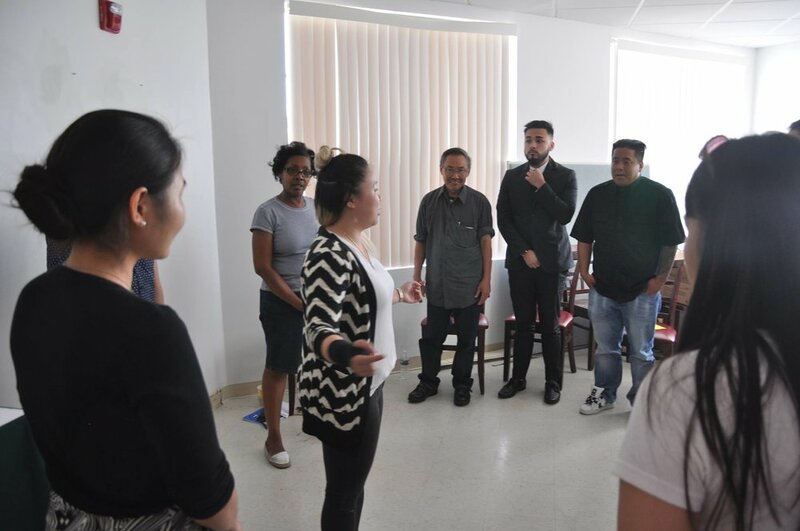 To get the team to loosen up and feel comfortable with each other, Kathy Le lead the Steering Committee into the game of "Where the Wind Blow." We then moved into the artists' design presentation and members shared further ideas and thoughts. Left to right: Michelle Christian, Hung Vu, Justin Nguyen, Tommy Nguyen, Tam Le, Grace Ejiwale. "Where the Wind Blows "
After the team building game, we jumped right into the process of the mural project, starting with its materials. Tran introduced the materials the project would be working with while Hung Vu, the engineer, explained the dimensions of the wall and its placement. Hung discussed how many board pieces would be required to cover the available wall. As people presented, Committee members took notes and did their best to ask questions and give feedbacks. Left to right: Kathy Le, Joan DoTruong, Duoc Nguyen, Cuong Nguyen. Top row: Tam Le; Middle row, left to right: Justin Nguyen, Hung Vu, Michelle Nguyen, Tommy Nguyen, and Grace Ejiwale; Awkward bottom row, left to right: Kathy Le, Joan DoTruong, Duoc Nguyen, Tran Vu, and Cuong Nguyen. The three-hour meeting ended up going over a few minutes, but that was not a problem! The Steering Committee did a lot to steer the designs and ideas the right way. The mural project is on its way thanks to the Steering Committee and the Artists team, but we are not done just yet. The team still has much more great work ahead of us. Thank you to everyone who made the meeting possible, especially to Phở Hòa Restaurant for providing the food and space! On this sunny Wednesday, in Reign Drink Lab, the artists gathered for a brief meeting where bright ideas for the mural was jumping around! We also did preparation for the Steering Committee meeting, in the upcoming Saturday! Though time wasn't on our side today, we did get a lot figured out. From symbols to purpose of each assigned ideas, we only get closer to making the mural happen. The next question for us to move into mural project itself is... How will our team put the ideas and themes into the project for the community? Guess we'll have to find out soon, where brighter ideas will come together! Community in Action: A Mural for the Vietnamese People is a 2017 cultural organizing project based in Boston’s Dorchester Community. This Project was made possible by NEFA’s Creative City Grant and TLe Enterprise. Thank you to everyone who supported us and our work!